We have been broken down in Heidelberg for 7 weeks already. In the area there is 5 towns we were going to visit with most of them on gravel road . We decided not to do so with motorhome as we were told the road are not suitable for this kinda vehicle. 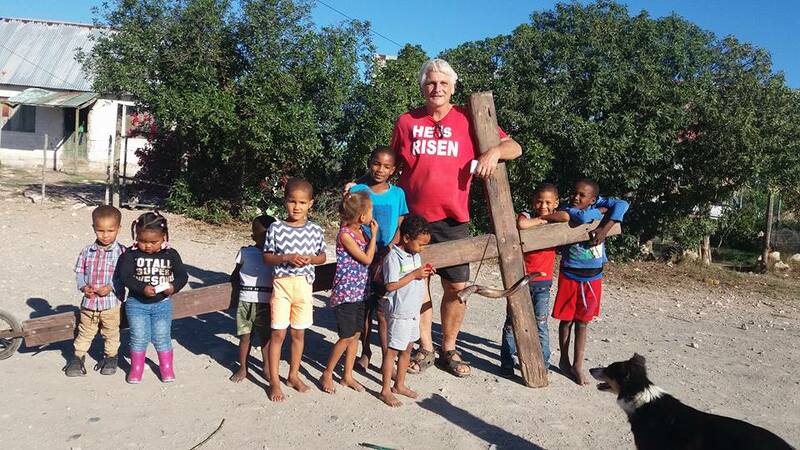 i asked a number of people and nobody was interested to take us with the cross or lend us a bakkie to visit these towns. a brother in Caledon said i can use his bakkie a few weeks ago and then changed his mind when i wanted to come and fetch it. Another person in Witsand last week said that i can use his car then we would pull the trailer with cross mounted on it. We were to get the car this Monday past to use for a week but he also changed his mind. 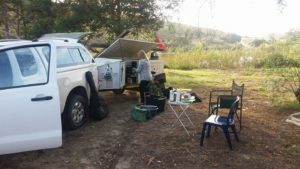 The next day we got a message from people we met in Jongensfontein which we didnt ask if we could use there bakkie letting us know that we can use it for a few days but they need it back by Wednesday latest giving us 5 days to visit the towns. This brother and sister delivered there 2015 Toyota bakkie in perfect condition to us and filled the tank for us. WOW praise God He is awesome. We left Saturday morning visiting Malgas then Ifanta and next day went to Vermaaklikheid. To our amazement the road although gravel is in very good condition and a normal car could go to all these places. A lot of people tried to discourage us from going there saying the road is very bad to Vermaaklikheid which it was not. From Vermaaklikheid we visited the brother and sister in Jongensfontein that lend us the bakkie. We had a blessed evening there and again they filled the tank for us. From there we proceeded to Plettenberg Bay and slept at family of Winnie on a farm. The next day we visited Wittedrift and then proceeded to George where we slept at the PW Botha hostel. 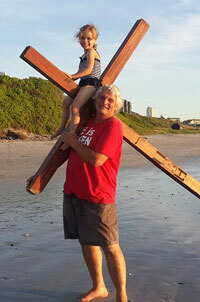 The next day we left for Herold to walk with the cross there and then headed back to Heidelberg to be back that afternoon to give back the bakkie to the owner. The amazing thing is that we traveled +- 800km stayed over 4 places and in total it cost us only +- R300. Part of cost we had to pay was the crossing at the pond twice R160 and some food and the rest of all our needs was met. Wow God touched so many lives in the towns we visited with the cross. Where ever we went it is as if people were there just at the right time and place as we walked with the cross. Spoke to a lot of children in Vermaakliheid.